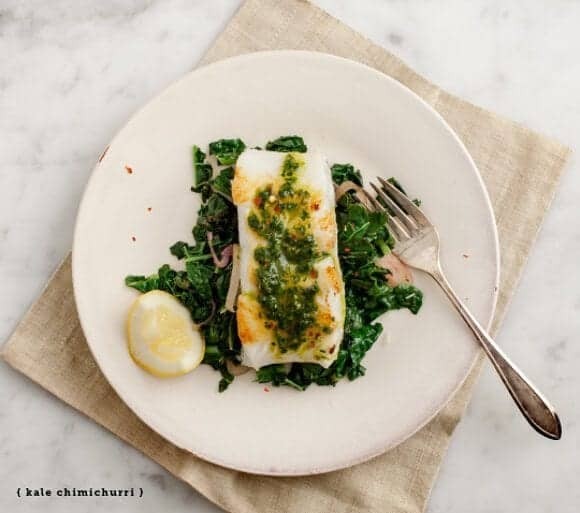 Challenged by Food52, here are five kale recipes! Spanakopita, Sushi Bowls, Kale and Eggs, Chimichurri, and Spanish Chickpea with Kale! Pulse all ingredients in a food processor, then drizzle in the olive oil while continuing to run the food processor. Taste and adjust seasonings. 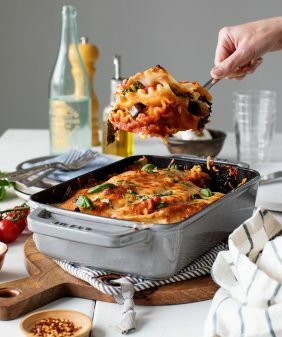 (Tip: this is bold in flavor on its own, so I suggest tasting it with a bit of whatever you're going to be serving it with before adjusting). Spoon on top of fish, meat, or veggies. 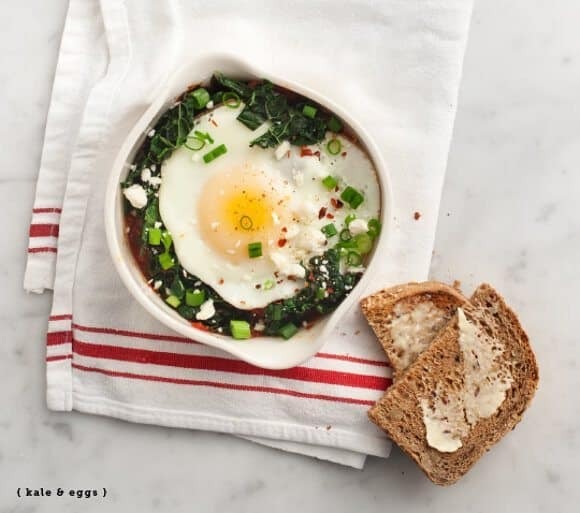 Place the kale in a medium bowl and mix in the feta cheese, garlic, scallions, dried oregano, salt, and pepper. Your filling should stick together, if it's crumbly, add some warm water a little at a time. Taste and adjust seasonings. To assemble, place 2 sheets of filo on your work surface. ** Brush it with melted butter, and slice it into 5 vertical strips. Place a teaspoon of filling at the bottom of each strip and roll it up, flag-style. 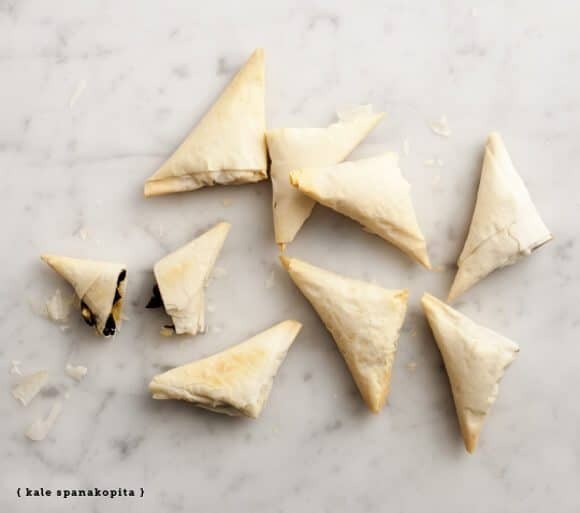 Repeat the process until you run out of filling (you'll have around 15 triangles). Brush the outside with butter and bake in a 425-degree oven for 20 minutes or until golden. If you're using fresh feta cheese that's on the wet side, you'll want to squeeze most of the excess water out of your blanched kale. If you're using the more-dry crumbly kind, you can leave the kale a little on the wet side because you'll need the moisture to help bind everything. *as you work, keep the extra filo dough under a damp towel so it doesn't dry out. Toss kale with olive oil and salt and bake in a 400 degree oven until crispy but not completely charred (6-8 minutes or so, check often, you may need to rotate it halfway). Chop and set aside. Toss rice with just a bit of rice vineger and a pinch of sugar. 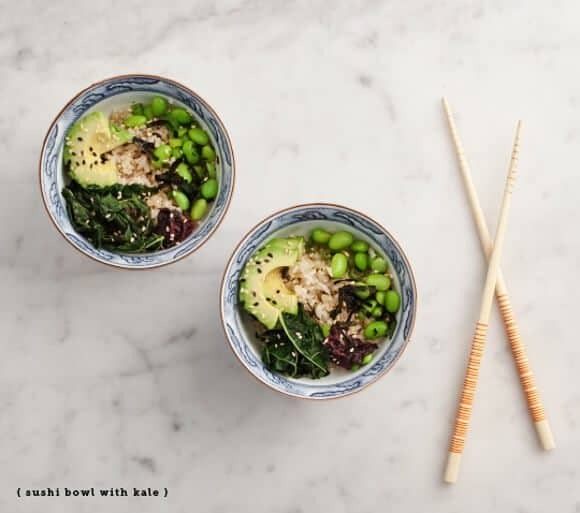 Place the rice in bowls and assemble your toppings. Mix soy sauce with a bit of rice vinegar and sesame oil and serve in little bowls on the side. Heat the olive oil in a large skillet over medium-low heat. Add the shallot, a pinch of salt, and cook until transluscent, about 2 minutes. Add the garlic, paprika, and saffron. Stir, and cook until just aromatic, about 30 seconds, being careful not to let it burn. Add the chickpeas and a bit more salt. Stir to incorporate. Turn the heat of the burner up a bit, and let the chickpeas cook until they begin to turn golden brown, stirring occasionally. Add the sherry vinegar and tomato paste, then the kale. Continue to cook for a few minutes until the kale is just wilted. Remove from the heat. Taste and adjust the seasonings, adding a little lemon juice if necessary. In an individually sized baking dish, mix the tomatoes with paprika, salt & pepper and layer it on the bottom. In a separate small bowl, toss kale with a little olive oil, balsamic, salt and pepper. Place the kale in the baking dish on top of the tomatoes. Top with feta cheese and chopped scallions. Crack 1-2 eggs into the dish and bake until set. About 10-12 minutes. 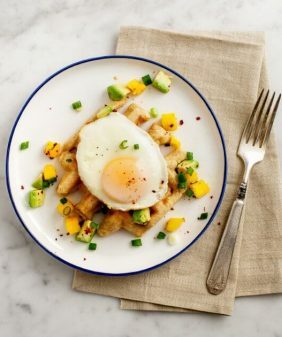 (Or fry the eggs separately and place on top). Finish with some freshly cracked black pepper. Loooove kale! 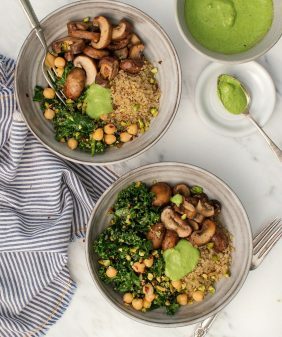 Every single kale photo here looks insanely delicious! Yum! I am amazed by your creativity and diversity of ethnic food. It’s always really interesting to see what you’ve got cooking. You live in Texas, right? Where does your Asian influence come from? ha, thanks! Yes I live in Texas, but I’m hardly Texan… I didn’t grow up here and also Austin is pretty diverse, especially for food. I’ve also traveled a bit… When I don’t know what to make I usually start by thinking of someplace I’ve been. (and I loved Japan and Japanese food). Congrats, I like Food 52 🙂 Everything looks delicious. these all look delicious! i only really make salads with kale which are good but get a little boring. Wow!! 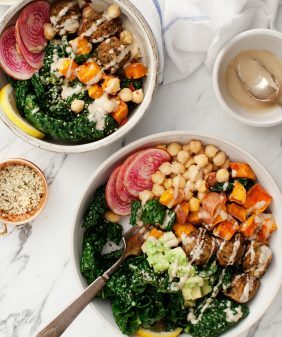 Al of these look delicious and I love kale! 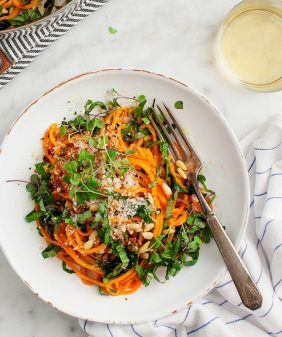 Congrats on food 52! I love that site! Your photos make me want to eat your food. AKA perfect food photography. i just made chimichurri last night with parsley, it never occurred to me to make it with kale. thanks for the great ideas! thanks for all these ideas for Kale!!! Lovely and that kale egg looks YUM, also the sushi bowl. 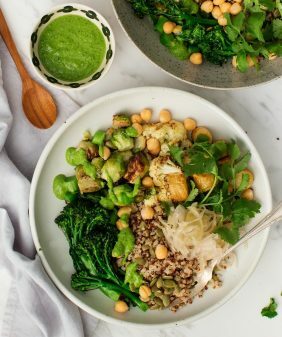 What’s the best way to store the crispy kale for the sushi bowls, as I’d like to make this ahead of time if possible? Many thanks for the wonderful recipes! hmm… I would probably put it in a bowl, loosely cover it and leave it out at room temp. Of all the parts to make ahead of time, the rice would be most convenient since it takes the longest. The kale is really quick at the end. 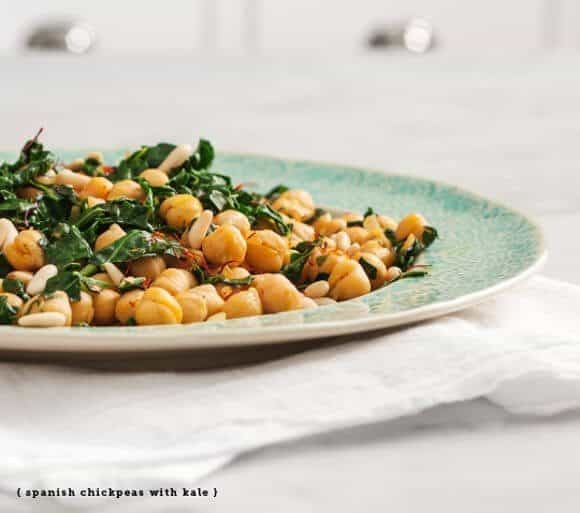 The Spanish Chickpeas with Kale was delicious! Good mix of flavours:) We ate every bite so my only complaint is that there was not more.